This entry was posted in News on May 13, 2007 by Arthur. 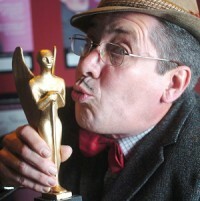 Count Arthur Strong led the way in this year’s Brighton Fringe picking up the all new prestigious Argus Angel Award. The Award, in its first year, is awarded by Brighton’s regional paper to celebrate excellence in the Festival and Fringe. Count Arthur Strong returned to Brighton with his sell out touring Musical and the home coming was played to the largest theatre crowd the expanded Komedia Brighton has hosted to date. Komedia hosted over half of the Argus Angel Award winners and also picked up the Best Venue gong at the Fringe Awards.